Tavares was lured to racing as a teenager flipping through car magazines. 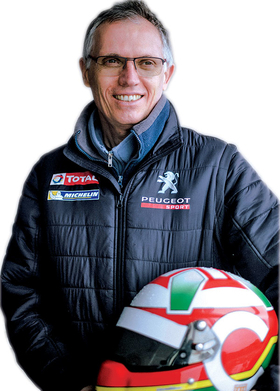 DIJON-PRENOIS, France -- Carlos Tavares is frustrated. It's detectable only by a slight edge in his normally measured voice, the same voice he has been using to assure skeptical journalists and investors that his audacious play to buy Opel and Vauxhall, General Motors' perpetually money-losing European operations, is a perfectly logical move for PSA Group, the French automaker he has run since 2014. Tavares has just finished dicing with about 35 other historic single-seaters at Dijon-Prenois, an undulating 2.4-mile course here in the Burgundy wine country of eastern France. 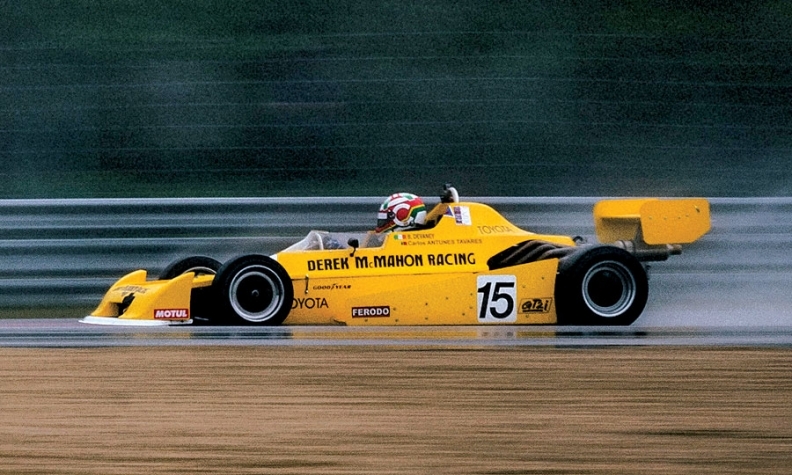 In a cold, driving rain on this day in May, he's managed to keep his 1979 Chevron B47 Formula 3 car from sliding off the slick track, but he finished midpack, and he's clearly not pleased. "If you can't see the track, then the cars start to overtake you," Tavares says in the pits after changing out of his sodden driving suit. "It's just a wall of water. I was trying to overtake a group of cars who I was much faster than, but I couldn't see, and I had to back off, and they just got away." "At that point, what you want to do is just bring back the car in one piece and keep it for the next race," he says with a shrug. With more than 500 races under his belt over 37 years, there's hardly an on-track condition or situation that the 58-year-old Tavares hasn't experienced. Racing, for him, is perhaps more natural than running a global car company with annual revenues of $59 billion and the potential, with the acquisition of Opel, to vault over his French rival and longtime former employer, Renault, to become Europe's No. 2 automaker. Over the years, the two sides of his life have become intertwined. PSA's annual meetings start with a rousing video of the company's racing efforts before Tavares and his fellow executives dive into the minutiae of free cash flow, operating margins and product mix. He has named his strategic plans Back in the Race (as PSA recovered from a severe financial crisis) and now Push to Pass, from the hot button that gives racing cars a quick jolt of power. Tavares races his 1979 Chevron B47 Formula 3 car. On the track, he wears the blue-and-red livery of Peugeot Sport, and in the last few seasons, he's been a top contender in European touring car endurance racing with a Peugeot RCZ. After his race, Tavares sat down for a wide-ranging interview with Automotive News to discuss his racing "addiction," his helmet emblazoned with a red and green motif as a tribute to his native Portugal by his side. Outside, a gaggle of Formula Fords wailed around the track, both drowning out and punctuating his responses. He's clearly intrigued by the potential of his Toyota-powered Chevron, which he bought just two months earlier. Despite its "primitive" aerodynamics, "The car is very smooth to drive on dry tracks," Tavares says. "Now I just need to bring my driving style closer to what a single-seater needs -- in the end, the car is not very powerful, so it's all about momentum and having speed through the corner so you don't penalize yourself in the next straight." He's hoping that a needed engine rebuild will unlock an additional 10 to 15 hp. Tavares caught the racing bug as a teenager flipping through car magazines. He volunteered to be a flag steward at the newly built Estoril track near Lisbon. "That was the moment that I caught this disease," he says. 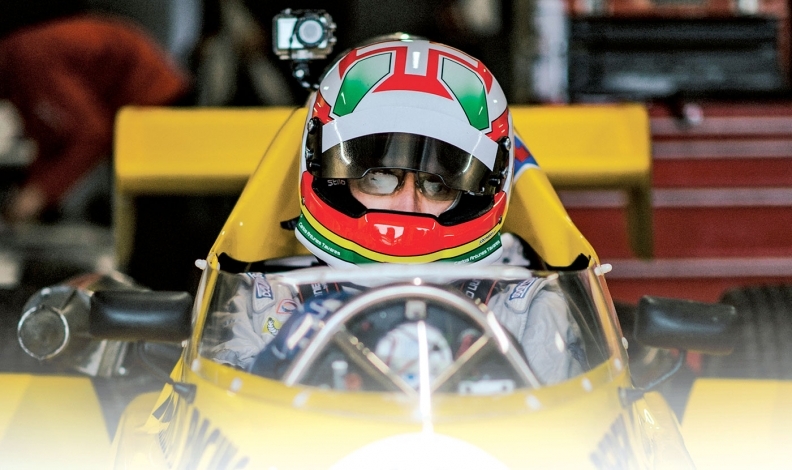 "I soon understood that racing was expensive, and therefore I had two choices: I could become a professional racing driver, or I could earn enough money to pay for my racing," Tavares says. "I discovered I was not talented enough, so I chose to be an engineer." The red and green colors on Tavares' helmet are a tribute to his native Portugal. After graduating from the prestigious Ecole Centrale Paris in France, Tavares started at Renault in 1981 as a test engineer. He caught the eye of Renault CEO Louis Schweitzer, who in 1998 gave him responsibility to develop a key model, the Megane 2. In 2009, Carlos Ghosn, who held dual CEO roles at Renault and Nissan, chose him to lead the Japanese automaker's North American operations. He moved to Nashville, where, he says, he "couldn't miss" NASCAR racing. But Tavares fell out with Ghosn, just a few years his senior, after a 2013 interview in which he expressed his desire to run a major automaker, and he left Renault. He was tapped to lead PSA in 2014, as the company was facing a serious financial crisis that was eased after the French government and the Chinese conglomerate Dongfeng each took 14 percent stakes. Imposing a relentless focus on cost cutting and performance, Tavares has led PSA to impressively high automotive operating margins (6 percent in 2016) for a company that is concentrated in the fiercely competitive European auto market. As he's developed as a manager, Tavares says, he has incorporated some key lessons from the track. "Despite the fact that there is only one driver, racing is a team performance, and that's the same thing in the company," he says. "Being the boss means that you need everybody to support you to get the job done. "The second one is self-control. In racing, you can lose your temper, and that won't lead to a good performance. In the company, it's the same: The more critical the situation is, the more calm you need to be," he notes. "It doesn't help to add frustration and emotion to the emotions that already exist. "And, of course, rigor," he concludes. "In big companies, operational excellence is key, and if you don't execute your plans properly, you are out of the race, as much as in the automotive business as in racing." Though he is involved in testing prototypes, Tavares says he does his best to take a hands-off approach to product development at PSA. "I try -- and this is not always possible because I am so passionate about it -- not to be directive because we are not making cars for myself; we are making cars for consumers," he says. "My job as CEO is not to give engineers direction. My job is to ensure that each person can unleash his full potential inside the company, in an organization that supports that. "Of course," he adds, "if we are testing prototypes, and I see something that is beyond the limits, I'll tell them, "Guys, this car will not go into production with this kind of problem, so fix it.'" Though Tavares is as proficient as any top executive in business argot, he believes his decades spent at the racetrack and wrenching on his own cars let him talk to his employees from a position of a fellow enthusiast. "It gives me the ability to have a good dialogue with many people in the company," he says. "If people realize they can connect with their CEO about cars, they can say, "At the helm of this company is a guy who likes cars, who understands what we are doing.'" Of course, racing is also about thrills, risk and driving on the edge of control. Tavares says he's never gone past his own limits in a racing car -- "but it will happen. There are moments like today, when you are in a pouring rain and you are flat out on the straight, and you can't see 20 meters in front of you." "What happens is I get frustrated when I don't deliver what I expected," he says. "But you are trained when you have been racing for 35 years to focus immediately on the next race, not on the result -- understanding what went wrong and what you should do differently." In addition to the Chevron, Tavares owns two Peugeots for historic rallies, a 504 and 104. He's not sentimental about his cars -- after all, they are tools for winning. "Generally speaking, I don't keep my racing cars. Typically, a car can be used in a competitive way for three to five years. When a car has lost its competitiveness, I don't store them away, I sell them." For all of Tavares' high public profile -- his every move is followed daily in the French business press -- racing remains a very private family endeavor. He drives himself to races around Europe with a few longtime friends, and he moves easily around the track in Dijon, greeting acquaintances, comparing notes on technique with the racers' language of hand gestures and drawing few second glances. His son-in-law Tristan Gommendy has been a Le Mans podium finisher, and during the interview, Tavares notes that he's anxious to check his standings in the World Endurance Championship race at Spa. "When we have Sunday lunch at home, the discussion is all about setups and how you will drive this corner or that corner," he says. His garage workshop outside Paris is the hub of his racing life and a refuge from the pressures of business. "What I enjoy the most is to have my friends with me," Tavares says. "When we are there with the music, with the tools and the cars -- the fact that we are doing it together is as much fun as the fact that we are doing the work ourselves." Outside, the rain shows no signs of stopping, and Tavares gives the weather a slightly worried glance. He'll race again the next day, against the same drivers. "Hopefully, we'll be able to see the track," he says, though he'll start far down the field, based on his results in today's race. "That's not so good." Like any true competitor, he adds, "But that means there will be more guys to overtake."